So as I am sure I’ve mentioned here before, Sherman is a bit of an escape artist. After all, my little sister didn’t get us this doormat for nothing. Anyway. Tonight, we were leaving the house to go hole up at Panera for some dinner and some Nanowriting (because it is, after all, November, and that is what we do in November), and as the front door swung open, Sherman came tearing out from under the couch, where he likes to lurk for EXACTLY this reason, and the person who came in the house last didn’t get the screen door shut (names withheld to protect the guilty except it wasn’t me, and okay, to be fair, his hands were full of groceries, but I digress), and despite some lunging forward on my part and some shouting on both our parts, the wily little fuzzbutt made a break for freedom. So we both flung all our Nanowrimoing stuff onto the front porch and dashed down the stairs, trying to catch a small grey fluffbrat who does not want to be caught because this is the Best Game Ever and possibly there was some swearing and also some laughing, and then, then, the most wonderful, miraculous thing happened. A woman came by, jogging along the sidewalk. A woman Sherman had never met before in his life. A stranger. Here is the thing about Sherman. Unlike most cats, Sherman loves people. I mean, he really, really LOVES people. He has never met anyone who is not his very best friend. Regardless of whether they might actually want to meet him, he will be right there, in their face, saying hi, demanding attention. We like to joke that he is shy. Hah. Anything but. So now we know. 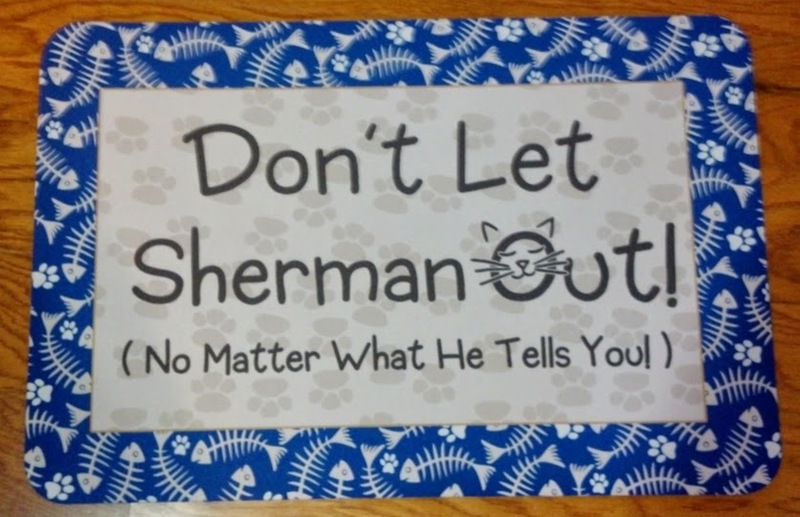 The next time Sherman manages to slip out the door, there is no point in wasting any time trying to chase him down. Nope, clearly all we have to do is find a stranger. Because the one thing in the world Sherman absolutely, positively cannot resist, is a stranger. My escape artist is almost 15 and has only three legs, but he still manages to dive out the door before I can catch him. He usually doesn’t go far anymore, thankfully — these days all he wants to do outside is eat grass and roll around on the front stoop.